Tom Barriball | Launceston Then! Thomas Stephen Barriball was born on March 24th, 1919 at the Bennett Arms, Lawhitton. He married Lucy Cornish in September 1944. 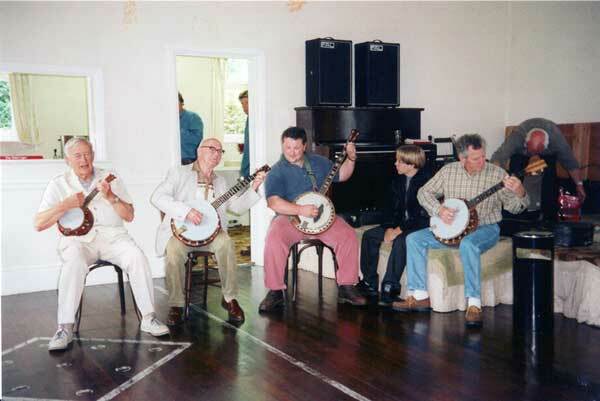 I think that I can really say that my banjo playing would never have come about, if it were not for my father, William Barriball, who learned his trade as a Wheelwright at his home business. It was at a place called “The Bennett Arms” (left) and was located about 21/2 miles from Launceston, on the Launceston to Tavistock Road. After serving his time, he eventually went to Plymouth to further his training and he happened to go to the Palace Theatre one night. One of the performers was a banjoist by the name of Jo George. Although father played the violin, he was much taken up with the banjo and, as he was in digs at Plymouth, he contacted Jo George and started to learn the banjo. He continued playing long after he returned to his home at the Bennett Arms to take an active part in the business. He and his sister, Nell (who was quite good at the piano) used to do turns at the local functions as a duo and they were always well received. I was born at the Bennett Arms on March 24th 1919. 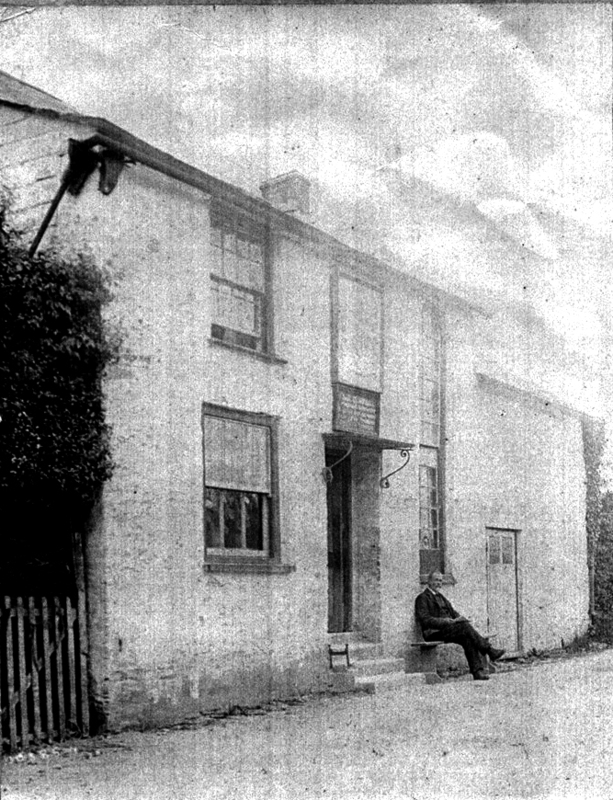 The Bennetts Arms, Lawhitton in 1900. Photo courtesy of Tarry Barriball. The Bennett Arms (pictured above) was roughly 25 acres and we had cows, sheep, pigs, etc., that had to be looked after, so it fell to my 3 elder brothers to help with the farming side. 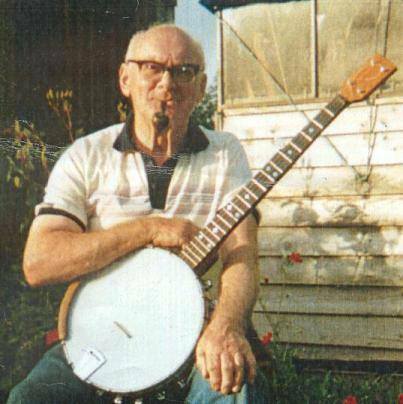 I was still young when I would ask my mother if I could have a go on my brother Fred’s banjo, unbeknownst to Fred of course. I simple loved the sound of the instrument and just longed to play it, but my hopes were shattered when Fred decided to sell the instrument because he had lost interest in it. Naturally, I was in tears for some time. However, my parents eventually presented it to me on my eighth birthday and said that it was mine. “Boy oh, boy, what a gift!” and also a great relief to know that I could muck about on it without worrying about where Fred was. I remember sitting on a low stool in the kitchen of the Bennett Arms with this Zither banjo on my legs. My father had shown me the chords of C. F. and G. which I thought was absolute magic; at last I was a banjoist! However, as time went on my father realized that I was keen and he began to help me more and more. With his helping me, it helped him to reclaim some of his skills, so, eventually, he bought another banjo as he had sold his own previously. Then he began teaching yours truly seriously. Highland Dance ‘ and ‘ Rugby Parade ‘ for encore and I can still recall the applause to this very day. 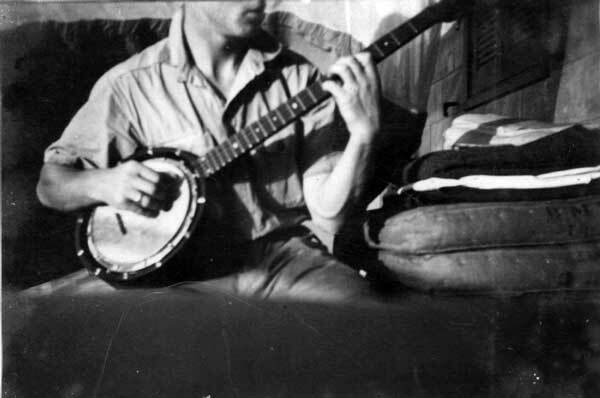 I really got onto the Band Waggon by that time and the truth is that the banjo played a terrific part in my life. In 1940 I landed in Egypt on my 21st birthday and 3 weeks after arriving at Heliopolis there was a talent contest at the camp and the entertainments officer heard that I played the ‘ jo ‘ and asked me to enter, I told him that I didn’t have a ‘ jo ‘ so he sent me into Cairo to get one. 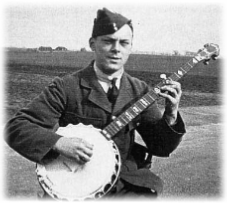 I didn’t look very hard, as I didn’t fancy playing to the troops, but when I got back to the camp and told him that I could not find one, he told me to look on the top of my locker, lo and behold when I looked, there was a W. E. Temlett Zither banjo which the entertainment officer’s wife had been using as a Uke. So I had to go on, and I did just that, and I won it. £6.00 first prize and a chance to broadcast, which I did for quite a while in the forces programme and every week I would say “Hello” to my mother and family but unfortunately she always forgot to turn on the Wireless or else she would be busy elsewhere, but my Aunt in Bristol used to listen every Thursday afternoon to me and never missed a programme. After I returned from Egypt I was posted to RAF (left) at St. Eval which is about 40 miles from the little village where my home was, so I used to cycle from St. Eval to Lawhitton whenever I had any time off, and one night as I was going back to camp, I was walking up through Wadebridge ( about 8 miles from St. Eval ) pushing my cycle and eating a pasty which my mother had cooked for me, the time was about 10.45 p.m. and as it was July time it was still good light and I had to be in camp by 23.59 one minute before midnight, anyway I was enjoying my pasty, and just taking my time, as it was fairly steep climb out of Wadebridge. I heard banjos playing up to my left, so I gulped down my pasty and dragged my bicycle up about a dozen steps. I knocked on the door which was answered by a young girl, I said to her ” I am sorry dear, but I can hear a banjo, and you can see what I have strapped to back,” and I was invited in, it was a birthday party and the two ‘banjo’ players were both plectrum banjoists, however, a good session started up and lasted until about 3.30 a.m. and I still had about 8 miles to go to get to camp. After thanking everyone for their kind hospitality I set off for St. Eval and arrived about 4.30 a.m. I was put on a charge and confined to camp for 3 days, it didn’t worry me a bit and one thing for sure is that they can’t take away the 4 or 5 hours of fun that I had, and it still brings a silent grin on my face when I think of that night. From around 1971 I used to teach Guitar at Launceston College every Thursday, also at St. Josephs Convent on Monday nights, Tuesday night, and Thursday until 9 p.m. after I had finished at the College at 4.p.m. At the College I used to do 28 pupils from 9 a.m. to 4 p.m. and at the Convent I had 32 pupils also 10 to 12 Guitar pupils of my own besides 6 to 7 banjo pupils, as you can imagine I used to be quite busy besides holding down a job in an office. Not long after I was demobbed from the RAF I started up a Dance Band, Piano Accompaniment, Fiddle, Banjo and Drums and from then until about 12 or 14 years ago I was in a Band of some sort all the time, if I wasn’t playing for Ballroom Dancing, I would be playing for Folk Dances and if not that, it was a Jazz Band. So you name it and I have had a crack at it at some time or another. When I first stood on the stage with a Folk Dance player called Bob Cann (pictured left), I didn’t know what to expect, but after we had played the particular tune once, I could manage to back him next 3time around, all these sort of experiences are good for learning chords, it will improve one’s capabilities and also boost your ego if ever I have one. Well, now I could go rambling on for ages about different gigs etc. but I think I will call it a day and let you all get back to what you were doing before you started to read this Epistle. Tom passed away in February, 2000. 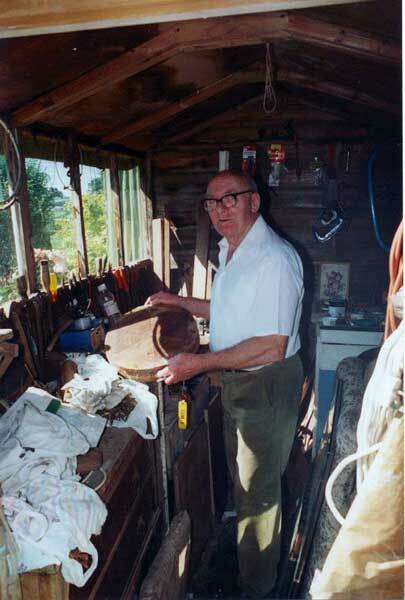 Tom Barriball in his workshop at Cargentle. Photo courtesy of Tarry Barriball. Tom Barriball playing a Temlett Banjo. One of the last Banjos ever made by Tom Barriball. 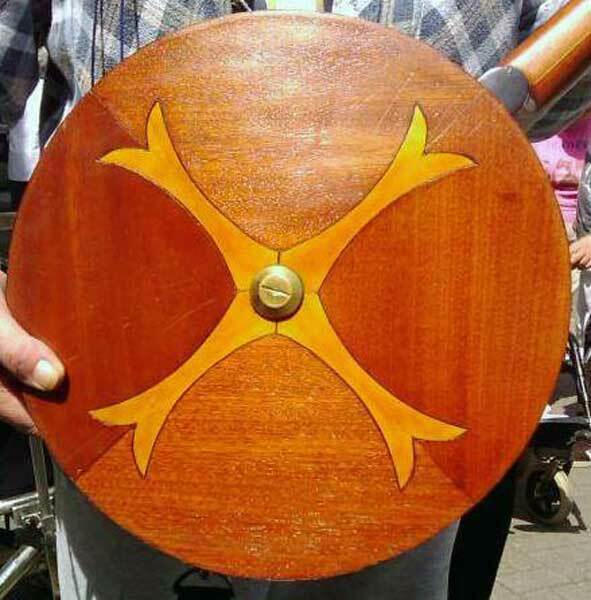 He always laid the ‘Celtic Cross’ on the back. Photo courtesy of Tarry Barriball. 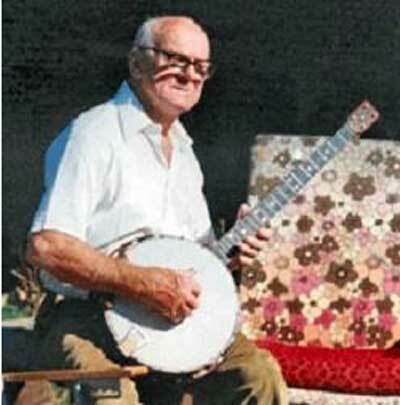 One of the last Banjos ever made by Tom Barriball. Photo courtesy of Tarry Barriball. Tom Barriball and band playing at the Fox and Grapes, Lifton. Photo courtesy of Tarry Barriball.